There is serious confusion in the Keta Municipality of the Volta Region over the President's nominee for the position of Municipal Chief Executive (MCE). The tension, which began mounting when the announcement was made about two weeks ago, has risen to a point where members of the governing New Patriotic Party (NPP) in the constituency seem to be divided over the eligibility of the nominee. President Akufo-Addo on March 13, 2019, nominated Godwin Edudzi Effah, an accountant with the Ghana Education Service, as the new MCE for Keta to replace the incumbent MCE, Seth Yormewu, who has also been moved to the newly inaugurated Anloga District Assembly (which was carved out of the Keta Municipality) as its first DCE. However, before the assembly members could vote to approve or reject the nominee, some card-bearing members of the NPP, including polling station executives, elders and other key grass-root members in the Keta Constituency, have questioned the eligibility of Mr. Effah. According to the group, who staged a spirited demonstration last Friday to contest the President's decision, Mr. Effah is not an indigene of Keta but rather from the Anlo Constituency where he is said to have held the position of Constituency Financial Secretary of the NPP until February 2018. 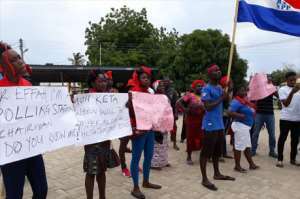 The group members, clad in red and wielding placards, chanted war songs and danced as they marched through the principal streets of Keta. On their placards and petition, they discredited the nominee and called for a withdrawal of his nomination. Prior to Friday's demonstration, the group petitioned the President last Monday through the Regional Minister, Dr. Archibald Letsa, and copied the Minister for Local Government and NPP National, Regional and Keta Constituency chairmen and executives. The group therefore demanded the replacement of Mr. Effah with a grass-root member from the constituency or risk stiffer resistance from members. In a response to the demonstration and doubts concerning Mr. Effah's nomination, the Keta Constituency Organizer of the NPP, Elikem Sewordor, described the claims against the MCE nominee as untrue. In a strong defence for the MCE nominee, Mr. Sewordor said it was unfortunate that people who should know better were describing Mr. Effah as an 'alien' in the Keta Constituency who does not deserve to serve as MCE. He said the claims against the nominee were absurd particularly when Effah was a card-bearing member of the NPP in the Keta Constituency where he also lives and votes at every election. Mr. Sewordor who was at a loss as to what would make his party members mislead the public alleged that the aggrieved party members may be acting out of disappointment that their preferred candidate was not nominated. In spite of that, he warned leadership of the party not to fall short in sanctioning members who continuously tarnish the image of the party and that of the President.